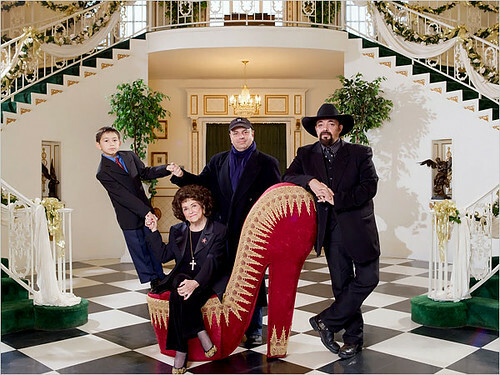 Ex evangelical preacher and gospel singer Toni Hart, shown here with her grandson and sons Daniel, Garry and Larry (Larry, Darryl and Darryl, anyone? ), knows a thing or two about living high on the hog, Lone Star State style -- even though she resides in Vegas. 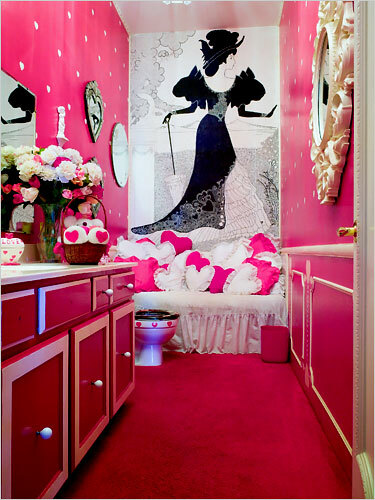 When asked why she needed 13 bathrooms, a talking cardboard Elvis, plasterwork that would make Louis XIV blush, and hot glued trim on everything, Ms. Hart replied, "I'm just from Texas. I like it big." "Big" means a living room so large it needs an EXIT sign over the door. 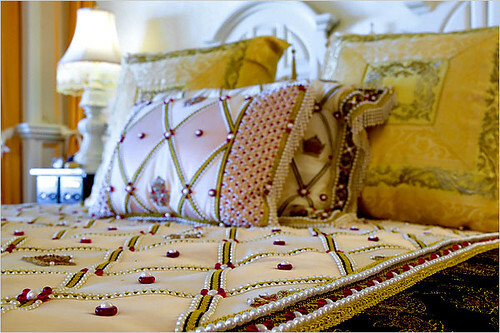 "Big" means a bedazzled 34 pound bedspread so heavy that Ms. Hart sleeps in a condo elsewhere, to avoid suffocating under the weight of all that bling blung. 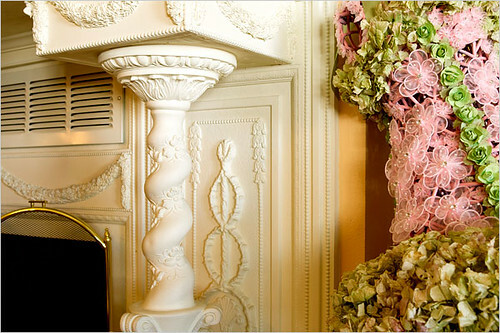 "Big" means funereal swags of dried flowers and a shitload of plaster detailing executed by her son Larry, who used a heavy hand when wielding a plaster filled cake icer. No joke. Perhaps in a show of Texan solidarity, I like this Larry character. 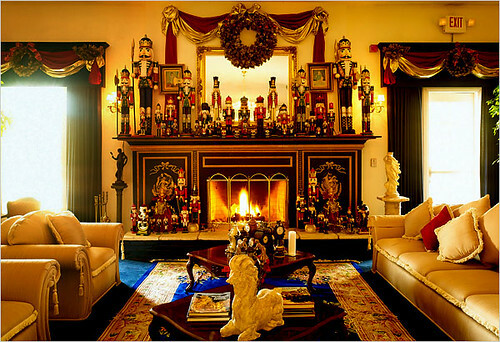 A self professed gluer of "things to other things," Larry is a DIY Liberace. Literally. 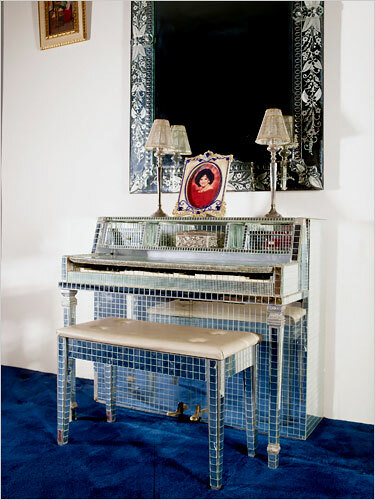 He glued every single shiny scrap of mirror to that piano. 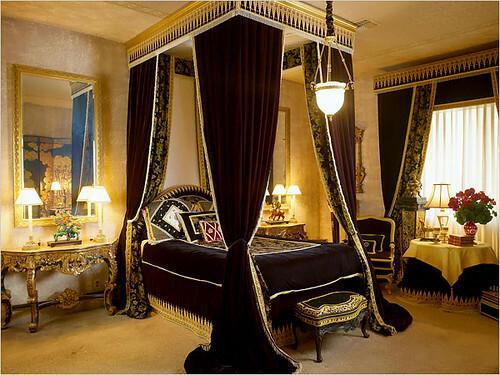 He even made all the bedding, drapes and upholstery, for The Velvet Room himself. Not that he's above shopping for premade bargains -- "All my family has a black belt in shopping, and we have radar when something is 70 percent off." To wit -- the headboard was bought for $15, and the table lamps for $10 each. But what I really want to know is, where can I get those swan planters? It's tacky as all get out, but a little piece of me thinks it might be fun to run rampant in this HALF ACRE sized, hot glued house. 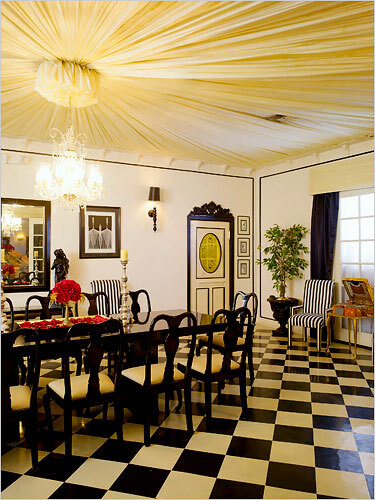 Just look at those checkerboard floors! 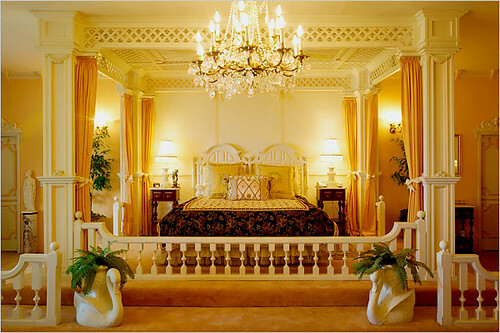 You know, with different chairs, different fabric on the ceiling, a different light fixture, and different styling, it could be fabulous. 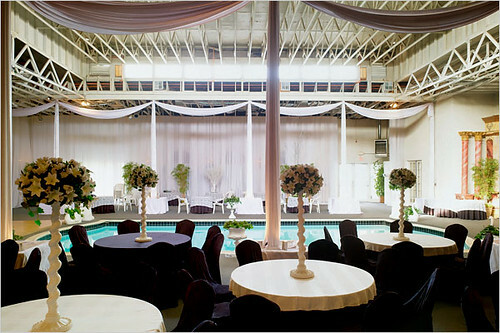 And who doesn't want their own indoor pool, surrounded by spectators? It's FESTIVE, for crying out loud. All this -- and more! -- can be yours for the low low price of $8.5 million dollars. Not bad for a 25,500 square foot house, which is twice as big as my Texas sized yard. I think I'm ready to move in. Hellfire ya'll, Texans are nothing if not friendly. I'm down for some company -- who's with me?